Booknotes & The Book World · Booknotes & The Book World · One Book. One Author. One Hour. “Booknotes” host Brian Lamb had a sincere respect for and curiosity about an author’s craft, and he believed that his audience did as well. He asked nearly every author who appeared on “Booknotes” about their own particular processes of gathering information and writing. This made the program about much more than the merits of that week’s featured book. Each episode offered a small window into the world of authorship. This passion for books inspired Lamb to become a writer on his own. “I immersed myself in the ...book world...so much that I wanted to do my own book,” he said in his 2015 oral history interview. 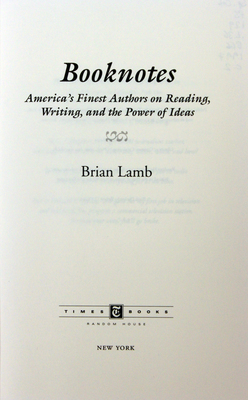 Brian Lamb authored five books about the “Booknotes” television program. Each one contained Lamb’s concise summaries of select interviews, along with his personal commentary. His initial work, Booknotes: America’s Finest Authors on Reading, Writing and the Power of Ideas, appeared in 1997. It summarized over 150 interviews with historians, journalists, and public figures. The follow-up, Booknotes: Life Stories (1999), dealt with biographers who appeared on the program. 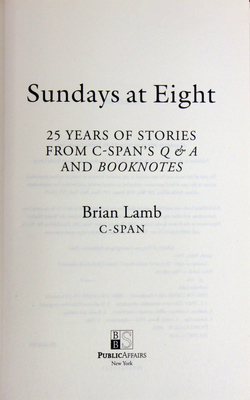 Lamb’s latest book, Sundays at Eight (2014), features highlights of author interviews from both “Booknotes” and C-SPAN’s other author interview program, “Q & A”, also hosted by Brian Lamb. The interviews in this volume span a more than 25-year period during which C-SPAN has been conducting this type of programming. It was preceded by Booknotes: Stories from American History (2001), which detailed dozens of interviews whose topics covered U.S. history from 1775 to the then present day and Booknotes: On American Character (2004) which covered authors of books on American social, cultural, and political issues. Peter Osnos, the founder and Editor at Large of Public Affairs Books of New York is interviewed as part of the Booknotes Oral History Project on January 22, 2015. In this interview Mr. Osnos discusses his association with Brian Lamb and the publication of his Booknotes books. Osnos also gives his own personal insight into Lamb’s style as an interviewer and author. 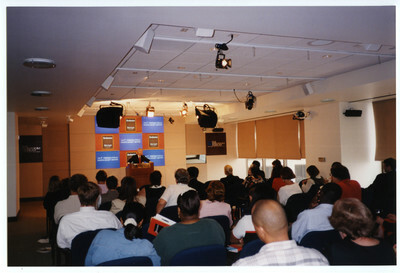 A book tour was organized for Lamb’s first book Booknotes: America’s Finest Authors on Reading, Writing and the Power of Ideas during the summer of 1997. He made speaking and book signing appearances in New York, Los Angeles, San Francisco, Houston, Nashville, Chicago, San Diego, Boston, and Washington, D.C., among other locations. He is photographed here signing a book for a fan of Booknotes. 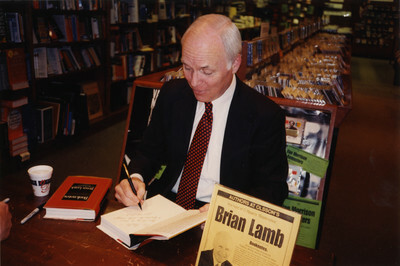 As part of his 1997 book tour in support of Booknotes: America’s Finest Authors on Reading, Writing and the Power of Ideas, Brian Lamb visited the Pacific Coast Center of the Freedom Forum in San Francisco in July of 1997. The Freedom Forum is a non-partisan organization which supports and promotes the First Amendment to the United States Constitution. There he spoke to an audience of “Booknotes” fans and signed copies of his book.